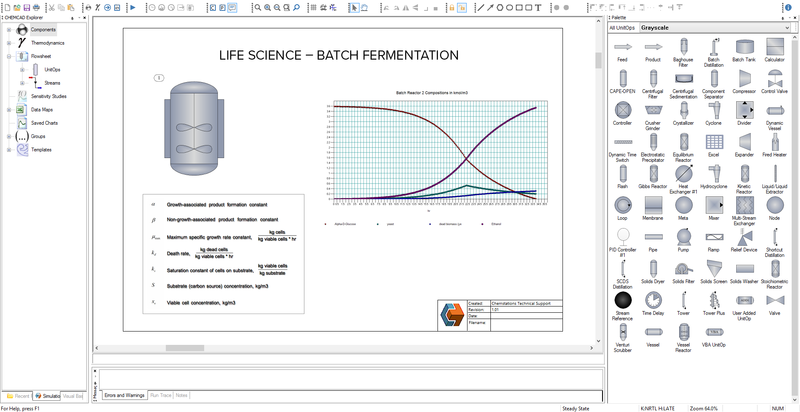 Batch Distillation: Used in CC-BATCH, this UnitOp allows you to model a batch distillation process without the complexity of CC-DYNAMICS. Dynamic Vessel: This UnitOp enables you to model a vessel using CC-DYNAMICS. Equilibrium Reactor: This UnitOp enables you to simulate reactors with multiple reactions defined by conversion or equilibrium ratios. Excel: This UnitOp creates a link to an Excel Spreadsheet. Flash: This unit op simulates a multiphase flash vessel. Heat Exchanger: This UnitOp can be used to simulate an exchanger with one or two input streams. 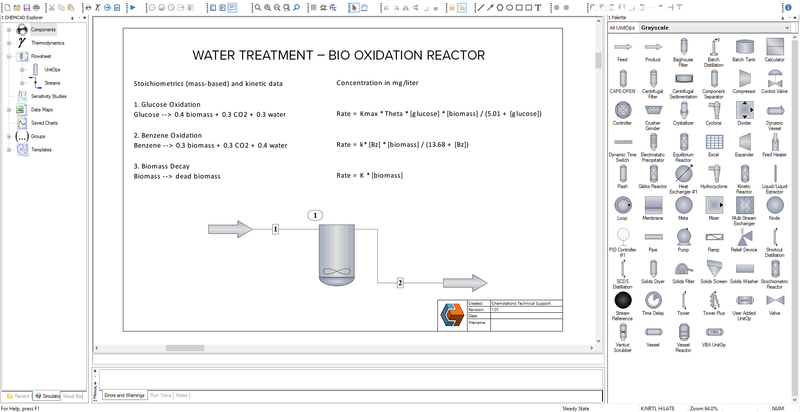 Kinetic Reactor: This reactor model enables you to rate or design plug flow reactors (PFR) and continuous stirred tank reactors (CSTR) using reaction kinetics. PID Controller: This UnitOp is used to sense a variable and generate a PID output signal to be used by a control valve in CC-DYNAMICS. SCDS Distillation: This UnitOp is designed for rigorous multicomponent distillation, including optional mass transfer and dynamics. Tower Plus: The Tower Plus module can simulate a tower with side strippers, pumparounds, side heaters/coolers, and side products. 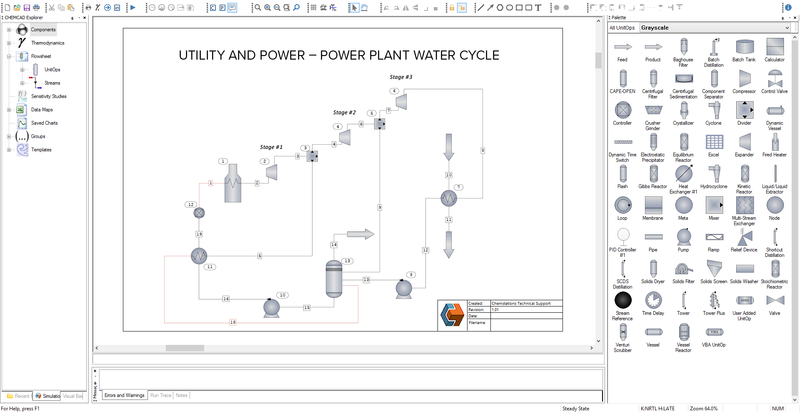 Vessel Reactor: Used in CC-DYNAMICS, this UnitOp enables you to simulate reactor vessels. Try CHEMCAD for FREE today! 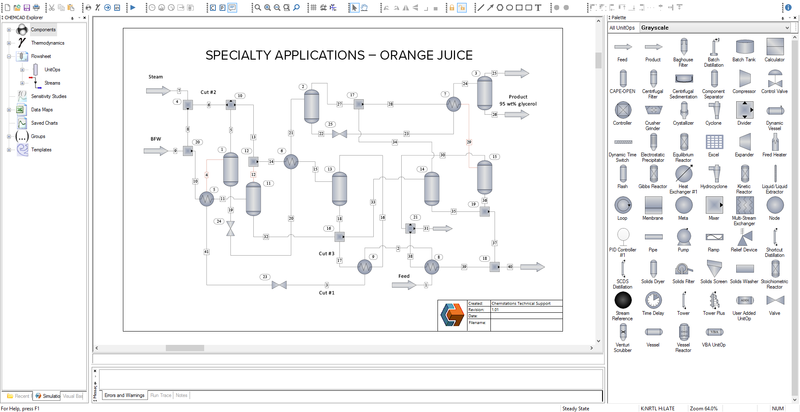 CHEMCAD Suite includes seven products that can be purchased individually or bundled as needed to accommodate specific industries, projects, and processes. 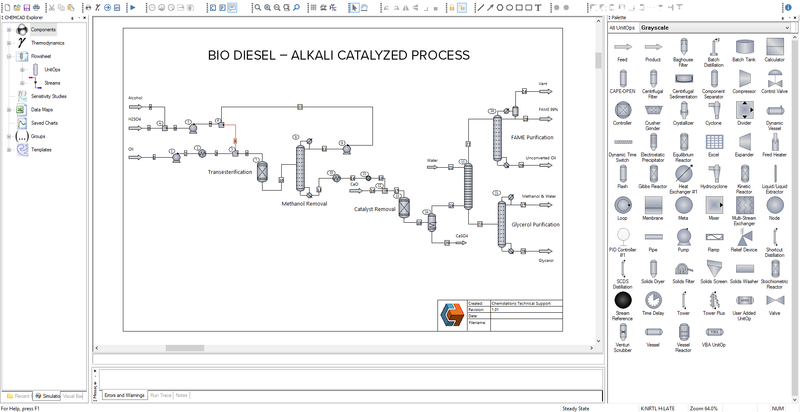 Chemical process simulation software that includes libraries of chemical components, thermodynamic methods, and unit operations to allow steady-state simulation of continuous chemical processes from lab scale to full scale. Ideal for: Users who want to design processes, or rate existing processes, in steady state. 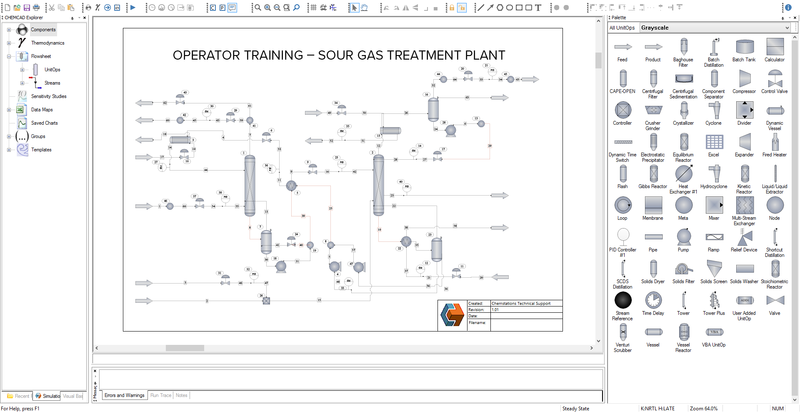 Heat exchanger design and rating software available as an add-on or standalone program. CC-THERM makes use of multiple international standards for design and materials to make sizing a heat exchanger faster and more accurate. The program covers shell-and-tube, plate-and-frame, air-cooled, and double-pipe exchangers. Rigorous designs are based on CHEMCAD’s foundation of physical property and phase equilibria data. Ideal for: Users who want to design or vet a design by a vendor of a heat exchanger (single unit at a time), and those who want to rate existing exchangers in new service or perform “what if” calculations. Piping and safety relief network simulation software that allows rigorous analysis of any piping network. CC-SAFETY NET combines the latest in two-phase relief device calculation, rigorous pressure drop calculation, rigorous physical property calculation, and rigorous phase equilibrium calculation to deliver fast, accurate answers. Ideal for: Users who need to design or rate piping networks or safety relief devices/systems. Physical properties and phase equilibria calculation software that is a subset of the CHEMCAD suite (all of the CHEMCAD suite products include CC-FLASH capabilities). This program allows rigorous calculation of physical properties and phase equilibria (VLE, LLE, VLLE) for pure components and mixtures. Ideal for: Users who need physical property and phase equilibrium data, as well as users who need property prediction and regression. 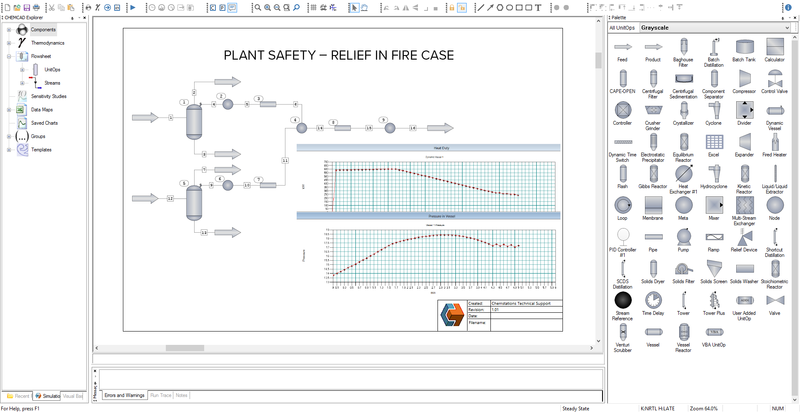 Process simulation software that takes steady-state simulations to the next level of fidelity to allow dynamic analysis of flowsheets. The possibilities are endless: operability check-out, PID loop tuning, operator training, even online process control and soft sensor functionality. Ideal for: Users who want to design or rate dynamic processes. 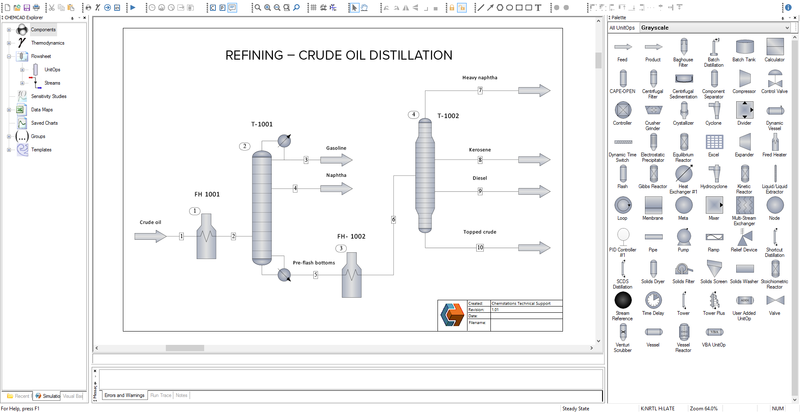 Batch distillation simulation software that, when used as an add-on or standalone program, makes batch distillation simulation and design easy with intuitive, operation step-based input. CC-BATCH is extremely flexible, with many operating modes and the capability to model any number of operating steps and conditions. CC-BATCH optimizes batch operation, minimizes intermediate “slop” cuts, and increases productivity. 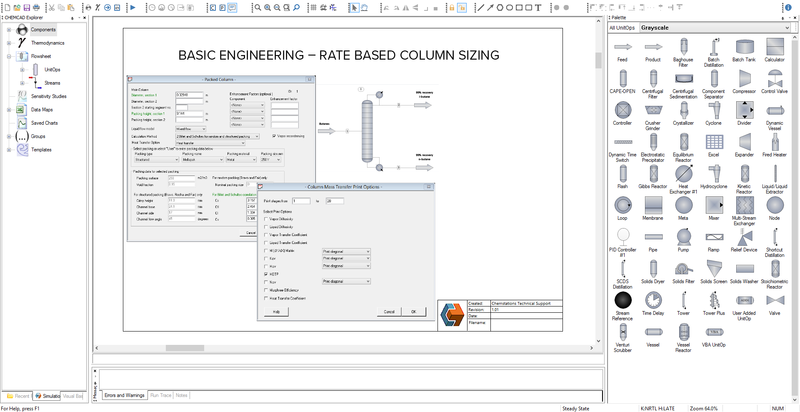 Ideal for: Users who want to design or rate a batch distillation column. The official Application Programming Interface (API) for interfacing with CHEMCAD. It is developed in Berlin and endorsed by Chemstations, Inc. in Houston, TX (USA). CC-API contains .NET Interface, a class library and an object model to access parameters in a CHEMCAD flowsheet. Add-on Manager administers DLL files for any number of unitops, enthalpy models, k value models, pipe models, or kinetic reaction rates. Ideal for: Users who connect standard software to CHEMCAD, embed CHEMCAD in another application, extend CHEMCAD with custom add-ons, or operate CHEMCAD in the cloud. Chemstations Europe GmbH, sponsor of the ECCE12 & ECAB5 Student Programme, calls for participation in a special PSC2019 Task Phase. Would you like to use CHEMCAD?